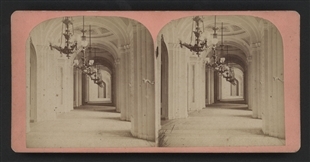 This early stereoview captured men lounging in the hallway outside the House Chamber. 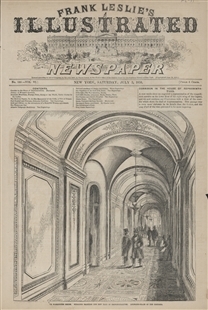 The ghostly figures intrigue today, but the original point of the image, however, was the impressive architecture of the new House wing of the Capitol. The saucer domes and chandeliers that march from foreground to background added to the three-dimensional effect when the image was looked at through a stereoviewer.